الیاسی, سمیه, اقبال زاده, افشین, جوان, میترا. (1394). اثر تنگ ‌شدگی مقطع ناشی از آبشکن در قوس بر الگوی جریان با نرم‌افزار FLOW-3D. نشریه آبیاری و زهکشی ایران, 9(6), 983-993. سمیه الیاسی; افشین اقبال زاده; میترا جوان. "اثر تنگ ‌شدگی مقطع ناشی از آبشکن در قوس بر الگوی جریان با نرم‌افزار FLOW-3D". نشریه آبیاری و زهکشی ایران, 9, 6, 1394, 983-993. الیاسی, سمیه, اقبال زاده, افشین, جوان, میترا. (1394). 'اثر تنگ ‌شدگی مقطع ناشی از آبشکن در قوس بر الگوی جریان با نرم‌افزار FLOW-3D', نشریه آبیاری و زهکشی ایران, 9(6), pp. 983-993. الیاسی, سمیه, اقبال زاده, افشین, جوان, میترا. اثر تنگ ‌شدگی مقطع ناشی از آبشکن در قوس بر الگوی جریان با نرم‌افزار FLOW-3D. نشریه آبیاری و زهکشی ایران, 1394; 9(6): 983-993. آبشکن­ها یکی از انواع سازه‌های هیدرولیکی هستند که به منظور تثبیت جداره خارجی رودخانه­ها و هدایت جریان مورد استفاده قرار می‌گیرند. با توجه به اهمیت شناخت الگوی جریان در اطراف آبشکن­ها، در تحقیق حاضر ابتدا الگوی جریان در اطراف آبشکن T شکل، مستقر در یک کانال قوسی 90 درجه شبیه­سازی شد. 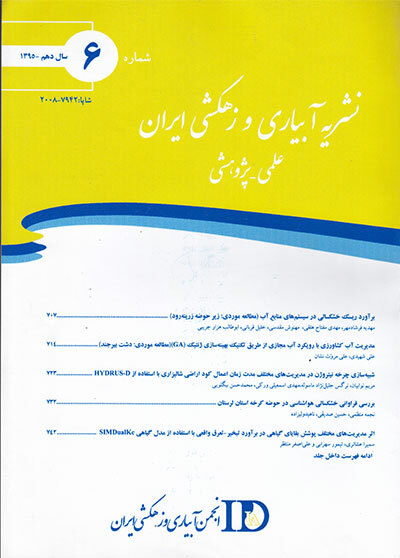 این کانال دارای بستر صلب بوده و به ترتیب دارای شعاع انحنا و نسبت شعاع به عرض 4/2 و4 است. برای شبیه­سازی الگوی جریان از نرم­افزار FLOW-3D استفاده شده و سپس اثر تنگ­شدگی مقطع بر الگوی جریان مورد بررسی قرار گرفت. جهت شناخت پروفیل سطح آب از مدل سطح آزاد VOF1و برای شبیه­سازی تلاطم جریان حول آبشکن از مدل‌ آشفتگی RNG k-ɛ استفاده شده است. نتایج این تحقیق نشان می­دهد که نتایج عددی و آزمایشگاهی تطابق به نسبت مناسبی دارند. نتایج حاصل از شبیه‌سازی­های مختلف به ازای تنگ­شدگی­های 10، 20 و 25 درصدی مقطع کانال بیان­گر این است که با افزایش تنگ‌شدگی مقطع، نوسانات سطح آب نیز بیش­تر شده و بیش­ترین ارتفاع در بالادست و کم­ترین ارتفاع در پایین‌دست مربوط به آبشکن با ابعاد بزرگ­تر است. علاوه بر این، گردابه‌ها نیز درطول بیش­تری از قوس در ناحیه پایین‌دست آبشکن ظاهر می‌شوند. Spur dikes are one of the many kinds of hydraulic structures, and they are employed in stabilizing rivers’ outer walls and redirecting the flow. Considering the importance of understanding flow pattern around the spur dikes, the present work firstly simulated the flow pattern around a T-shaped spur dike located in a 90 degree bend channel. The rigid-bed channel’s curvature radius and radius to width ratio were respectively 2.4 and 4. FLOW-3D was used in order to simulate the flow pattern, and the effect of section constriction on the flow pattern was studied afterwards. VOF was used for distinguishing the water surface profile from the open surface model, and RNG k-ɛturbulence model was employed to model the turbulent flow around the spur dike. The piece of research indicated an acceptable correspondence between numerical and experimental results. The results obtained through various simulations per 10, 20 and 25% constrictions of the section indicated that increase in section constriction would increase the water surface fluctuations, and the maximum height upstream and the minimum height downstream were observed in the case of the large spur dike. In addition, the vortices appear over a longer area of the bend, downstream the spur dike. استادی،ف.، مجدزاده طباطبایی،م.ر و علی محمدی،س. 1393. بهینه­سازی مدل برای طراحی ابعاد آبشکن رودخانه ای و نقش آن برای بهبود مورفولوژی رودخانه، مجله هیدرولیک. 9. 4: 55-72. صفرزاده،ا. 1383. مطالعه عددی قدرت جریان ثانویه در قوس رودخانه، سمینار کارشناسی ارشد، دانشگاه تربیت مدرس، تهران. واقفی،م.، قدسیان،م. 1388. مطالعه آزمایشگاهی قدرت جریان ثانویه و ورتیسیتی در قوس 90 درجه توام با آبشکن T شکل منفرد. مجله مهندسی عمران، 21: 111-128. Copeland,R.R. 1983. Bank Protection Techniques Using Spur Dikes, Hydraulic Laboratory, U.S. Army Engineer Waterways Experiments Station Vicksburg Mississippi. Elyasi,S., Akhtari,A.A and Seyedashraf,O. 2015. A Numerical Study of the Effect of Submerged Groyne Shapes on Flow Pattern in Straight Open-Channels. International Bulletin of Water Resources and Development. 3.1:72-80. Fazli,M., Ghodsian,M and Salehi,S.A.A. 2008. Scour and Flow Field around a Spur Dike in 900 Bend. International Journal of Sediment Research 23 56-68. Gill,M. A. 1972. Erosion and Sand Beds around Spur dikes, Journal of Hydraulic Division. 98.9: 78-89. Kassem,A.A and Chaudhry,M.H. 2002. Numerical modeling of bed evolution in channel bends, Journal of Hydraulic Engineering. 128:507-514. Masjedi,A., ShafaiBejestan,M and Moradi,A. 2010. Experimental study on the time development of local scour at a spur dike in a 180° flume bend. Journal of Food, Agriculture and Environment. 8. 2: 904-907. Mesbahi,J. 1992. On Combined Scour near Groynes in River Bends. M.Sc. Thesis, Delft Hydraulics Report HH 132. NajiAbhari,M., Ghodsian,M., Vaghefi,M and Panahpur,N. 2010. Experimental and numerical simulation of flow in a 90 bend. Flow Measurement and Instrumentation. 21:292-298. Olsen,N.R.B. 2009. Three-dimensional numerical model for simulation of sediment movement in water intakes with multi block option. Department of Hydraulic and environmental Engineering, The Norwegian University of Science and Technology. User's manual. Perzedwojski,B., Blazejewski,R and Pilarczyk,K.W. 1995. River Training Techniques: Fundamental, Design and Application. A. A. Balkema, Rotterdam, Netherland. Rajaratnam,N and Nwachukwu,B.A. 1983. Flow near groin-like structures. Journal of Hydraulic Engineering 109.3: 463-480. Roca,M., Vide,J.P.M and Blanckeart,K. 2007. Reduction of Bend Scour by an Outer Bank Footing Design and Bed Topography. Journal of Hydraulic Engineering.133.1: 155-167. Solimani,M.M., Attia,K.M., Kotb Talaat,A.M and Ahmed,A.F. 1997. Spur Dike Effects on the River Nile Morphology after High Aswan Dam. Congress of the International Association of Hydraulic Research, LAHR. 120.9:125-146. Vaghefi,M., Akbari,M and Fiouz,A.R. 2014. Experimental Investigation on Bed Shear Stress Distribution in a 180 Degree Sharp Bend by using Depth-Averaged Method. International Journal of Scientific Engineering and Technology 3.7: 962-966. Vaghefi,M., Akbari,M and Fiouz,A.R. 2015. An experimental study of mean and turbulent flow in a 180 degree sharp open channel bend: Secondary flow and bed shear stress. KSCE Journal of Civil Engineering 1-12. Vaghefi,M., Akbari,M and Fiouz,A.R. 2015. Experimental Investigation of the Three-dimensional Flow Velocity Components in a 180 Degree Sharp Bend. World Applied Programming. 5.9: 125-131. Vaghefi,M., Ghodsian,M., SalehiNeyshaboori,S.A.A. 2009. Experimental study on the effect of a T shaped spur dike length on scour in 90° channel bend. Arabian Journal for Science and Engineering.34.2B: 119-126. Vaghefi,M., Shakerdargah,M and Akbari,M. 2014. Numerical Study on the Effect of Ratio among Various Amounts of Submersion on Three Dimensional Velocity Components around T-shaped Spur Dike Located in a 90 Degree Bend. International Journal of Scientific Engineering and Technology.3.5: 675-679. Vaghefi,M., Shakerdargah,M and Akbari,M. 2015. Numerical investigation of the effect of Froude number on flow pattern around a submerged T-shaped spur dike in a 90◦ bend. Turkish Journal of Engineering and Environmental Science. 38.2: 266-277. Wu,W., Rodi,W and Wenka,T. 2000. 3D numerical modeling of flow and sediment transport in open channels. Journal of Hydraulic Engineering. 126: 4-15. Ye,J and McCorquodale,J.A. 1998. Simulation of curved open channel flows by 3D hydrodynamic model. Journal of Hydraulic Engineering. 124:687-698. Zhang,H., Nakagawa,H., Kawaike,K and Baba,Y. 2009. Experiment and simulation of turbulent flow in local scour around a spur dyke, International. Journal of Sediment Research. 24.1: 33-45.